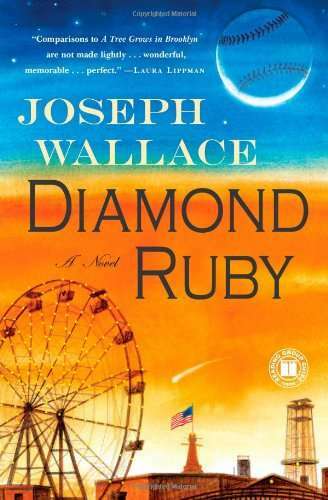 I romanticize baseball and I read all kinds of baseball books, but there’s a special place in my hardball-shaped heart for great baseball fiction: The Natural, Shoeless Joe, You Know Me, Al, and now Diamond Ruby by Joseph Wallace (Touchstone). Diamond Ruby is a baseball story, but it’s much more than that. Loosely based on the true story of Jackie Mitchell, a girl pitcher who struck out Babe Ruth and Lou Gehrig in exhibition play, Wallace creates the world that might have been. In 1923, 18-year-old New Yorker Ruby Lee Thomas is pressed into bringing up her two small nieces, after the 1918 Spanish influenza wreaks havoc on her family. And it turns out that she can support them with a gift she has. She is a fast pitcher. A very, very fast pitcher. Hired by a Coney Island sideshow, Ruby, a Jew, gets the ire of the Klan, but also wins the veneration of Babe Ruth and Jack Dempsey. Eventually she is rescued from the grueling sideshow and signed to The Brooklyn Typhoons. Here we meet gangsters and good guys and a punch-packing story. I was rooting so hard for Ruby, I started thinking of her as my own kid. With highs and lows like the roller coaster whose shadow Ruby plays in, Wallace writes a devastating, moving, funny, and ultimately feel great book. Diamond Ruby belts it out of the park and makes you long for a sequel.